Town centre church in short distance of the market place with ample car parking next to the church. 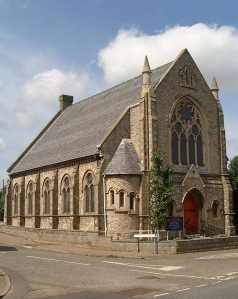 Trinity is a favoured church for weddings and other special events with a congregation which seeks to reach out into the community. The premises have been recently extended. (Junior Church also at 10:45am). Address: Theatre Street, Dereham, Norfolk. NR19 2EP. Tuesday: 2:45pm Women’s Own Fellowship. Bible Study and House Groups alternate on Tuesdays at 7:30pm in member’s homes. Please contact the Minister for details. Coffee Mornings: 1st and 3rd Thursday of the month at 10am. Luncheon Club (pre-booked meals): 2nd Thursday of the month at 12pm. Midweek Holy Communion: 4th Thursday of the month at 10:30am. Braille Singing the Faith hymn book available.